Hailey Joy overcame her nerves to win the 3-A state golf championship and lead Rockingham County to its third straight title. Joy, a senior, opened with the best round of the tournament, a 3-under 69, at Foxfire Resort & Golf Club. She struggled to a 76 in the final round for a 145 total but still won by three shots. Chapel Hill’s Gina Kim, one of the nation’s top junior players who is headed to Duke, did not compete in the high school tournament this year. Kim’s absence opened the door for a new champion this year. She had won the 3-A title two years in a row. Her coach, Ed Ibarguen, the director of golf at Duke University Golf Club, said Kim decided to take off the high school season because of the busy summer schedule she played. She competed in AJGA tournaments, the Junior Ryder Cup and even qualified for an LPGA tournament. Joy had a four-shot lead after the first round and was firmly in control after shooting 1-under on the front nine in Day 2. But her nervousness began to show as she shot 41 on the back nine, including a double bogey on the last hole. The second round was played under lift, clean and place conditions after heavy overnight rain. 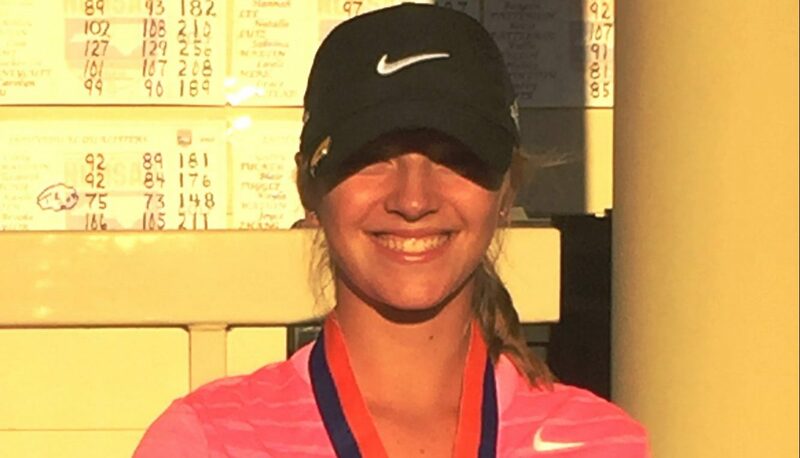 Joy, who has committed to play golf at UNC Greensboro next year, still finished three strokes ahead of Kayla Smith of Burlington Williams and Katharina Floyd of Pittsboro Northwood, who tied for second for the second straight year. They both shot 148. “I’ve always watched some really good girls win the state and to be a part of that group now means a lot to me,” Joy said. Olivia John, who won the East Central Regional tournament with a 68, shot 78-74 for 152, and sophomore Victoria Cook shot 80-78 for 150 to account for the winning team score of 455. “This proves that hard work and determination will pay off,” Williams said of his team’s title run. The Cougars shot 227 in the first round to open a 22-shot lead over Northern Guilford. Joy said the team was afraid something might go wrong overnight. But no calamity befell the Cougars and they continued to pour it on in the second round, outscoring Northern Guilford 228 to 242, for a 36-shot win. Cook, a sophomore, will become the team leader next year when the Cougars try to win their fourth straight title. Williams is optimistic the team can keep its winning streak going. Smith shot 75-73 to finish three shots behind Joy. Smith was six behind after the first round and was still in contention after a 1-under 35 on the front nine the second day. But she was derailed by a double bogey on the par-4 11th hole. Smith, a junior, was part of a Burlington Williams team that finished second 25 shots behind Rockingham County last year. But the Bulldogs didn’t make it to the state tournament this year. For Northern Guilford, it was another runner-up finish behind the Cougars. The Nighthawks finished second in the conference and at the East Central Regional behind Rockingham County. Victoria Ladd led the Nighthawks with rounds of 77-75 for a 152 total. She tied for fourth place in the state in the individual standings. Siana Wong shot 82-83 for 165 and Anna Hillman had 91-84 for 175 to complete the team scoring at 491. Ladd, a junior, returns along with Wong and Cami Rivas, who shot 190 at the state tournament. The nucleus gives Bonham hope the Nighthawks might be able to end Rockingham County’s streak next year. But first, Williams is celebrating another title after winning the first one in 2015 by five shots over Lee County.